Take an in-depth look at the Luge Relay event as they build to its Olympic debut at the upcoming Sochi 2014 Winter Games. With the announcement of Tokyo winning the bid for the 2020 Olympic host city this afternoon and the Sochi 2014 Torch relay only 29 days away, I’m getting very excited about my upcoming trip to experience my third Olympic Games! In 2010, the Olympic Torch Relay came right by my building when I lived smack downtown at Howe and Nelson. This was the true beginning of that amazing energy we felt in our city for the duration of the Vancouver 2010 Winter Games. I cannot WAIT to feel that energy again when I arrive in Sochi! To view my photos from the final stretch of the Vancouver 2010 Relay, please visit the set on Flickr. Sadly, I will miss the 2014 relay, as I won’t be in Russia just yet. But I do plan to find and hold one while I’m there to add to my Olympic torch photo collection. The question is, will I be wearing my Canadian or Dutch colors for this one? The torch is one of the key symbols of the Games and often captures the imagination of the world. With its bright, eye-catching design, the Sochi 2014 torch, shown here, is intended to reflect Russian hospitality, and the joyful and inspirational atmosphere which is an integral part of the Olympic Torch Relays. The Flame for the XXII Olympic Winter Games of 2014 will arrive in Moscow on October 6th, 2013, after being lit on the ancient ground of Olympia. From there, it will begin its 123 day journey across the territory of Russia. It will be seen by the residents of 83 regions of the Russian Federation and the coverage of the relay will be 90% of the country’s population. The Olympic torch will be carried by a record number of torchbearers. 14 thousand people will have the opportunity to run with the lit torch across the cities of Russia, and more than 30 thousand volunteers will be active at the relay. It will travel more than 65,000 km in the 123 day journey. 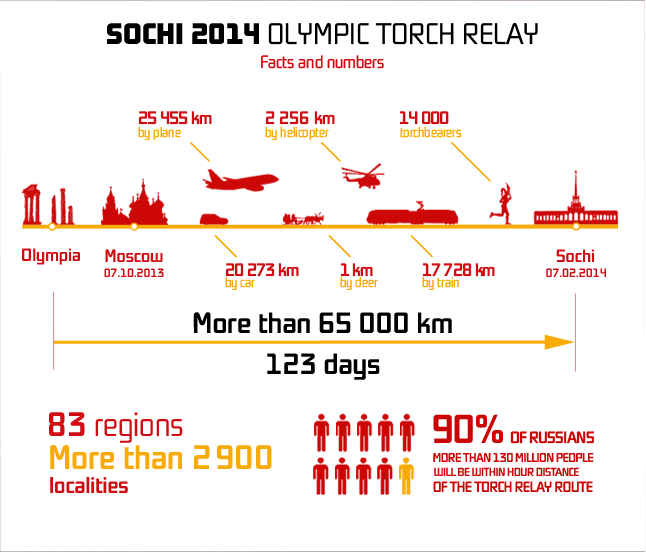 For more information about the Sochi 2014 Olympic Torch Relay, please visit www.torchrelay.sochi2014.com. The countdown is at 206 days and I’m finding myself thinking more and more about Sochi! With just over a year until the 2014 Winter Games (389 days), the torch was unveiled last night, as we slept here in Vancouver. The torch has a fun, modern and elegant design, and I, personally, am loving that they used the traditional Russian red! The Olympic torch’s Paralympic counterpart is blue. You can see an image of it here. “The concept behind the torch for the 2014 Games is based on the contrasts of Russia. It combines motifs from Russian folklore with ideas of innovation and technological breakthroughs. Its pattern is something that all Russians have been familiar with since childhood, when they first hear the fairy-tales and legends about the Firebird, or the Phoenix which rose from the ashes. The torch design was developed by a Russian creative team, led by Vladimir Pirozhkov and Andrei Vodyanik. The designers paid particular attention to the torch’s construction and its flame-lighting system. The construction of the torch ensures that the flame burns reliably in difficult conditions, such as strong winds, heavy frosts or any surprises that a Russian winter can throw up. 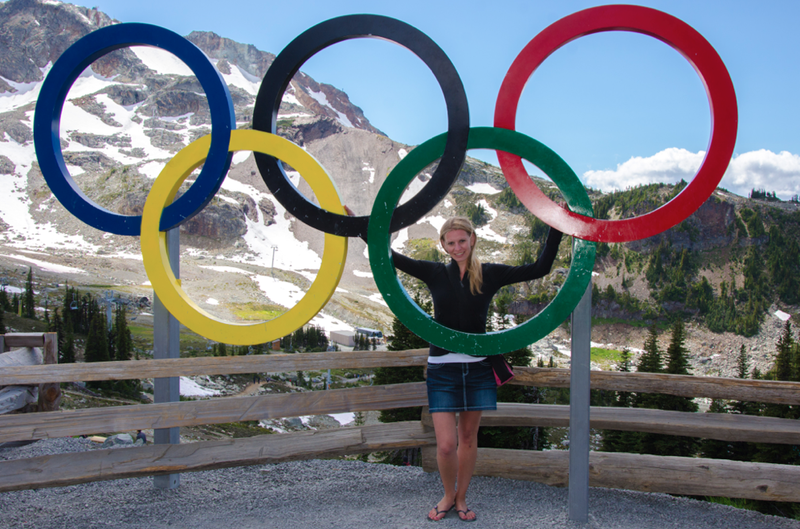 I had the opportunity to get up close and personal to both the Vancouver and London Olympic torches, and now I’m looking forward to picking up the 2014 torch in Sochi! I’m very excited to make that a reality! Less than 389 days to go! For more images of the Sochi 2014 Olympic and Paralympic torches, please visit the Sochi 2014 Flickr page.